“Bap Sang” is made up of two words “bap” which means “cooked rice” and “sang” which means “table” in Korean. “Bap Sang” means “a table at which meals are enjoyed” in Korean (I took this definition from a Korean food blog, Korean Bapsang). 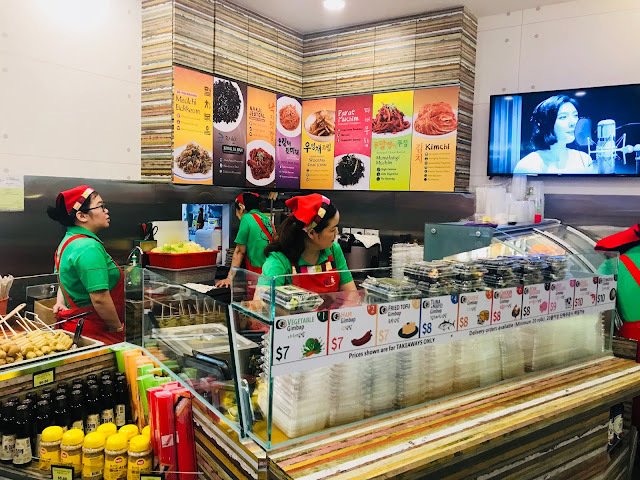 Located at Tower 3 (East Wing) of Suntec City Mall, Wonderful Bap Sang and Lee Mart Kitchen aim to introduce authentic Korean food to Singapore. 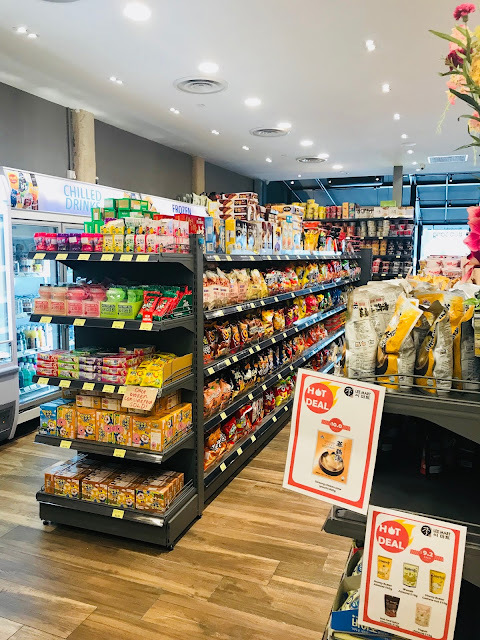 As you enter the restaurant, you will be greeted with the Korean speciality mart Lee Mart Kitchen to your left and a takeaway counter to your right. 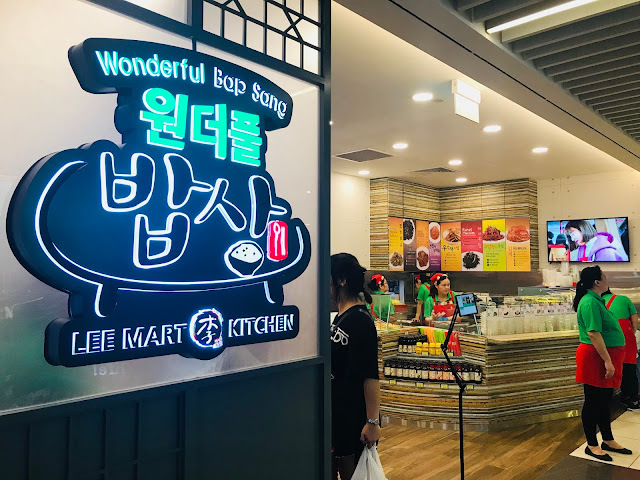 Walk to the end of Lee Mart Kitchen and you will find yourself standing at two entrance to the restaurant, Wonderful Bap Sang. 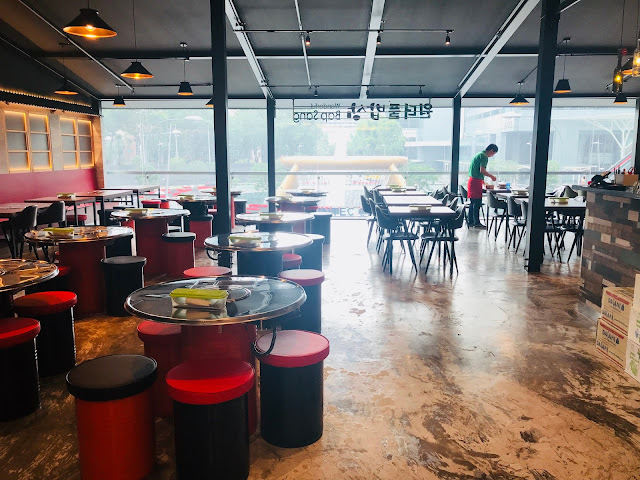 Ceiling-to-floor glass windows allow plenty of sunlight to stream in, illuminating the entire restaurant which is decked out in industrial decorations of black ceiling beams and pillars and black and red stools. I love the seats by the window where the sunlight warms me while I sample the delicious Korean food Wonderful Bap Sang has to offer. 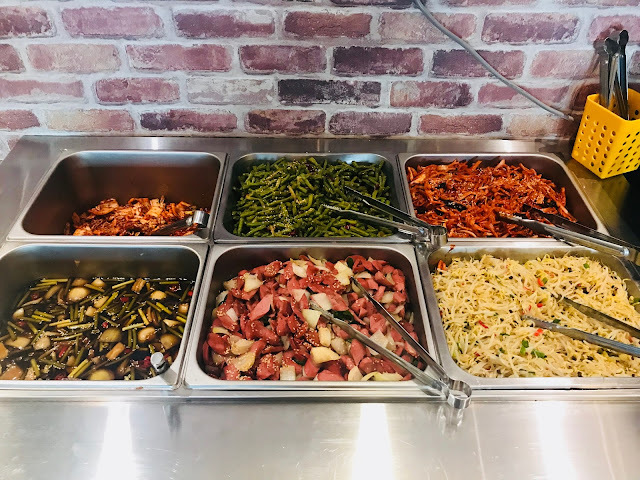 All meals are accompanied by a free-flow side dish bar which features 6 different side dishes, varying daily. 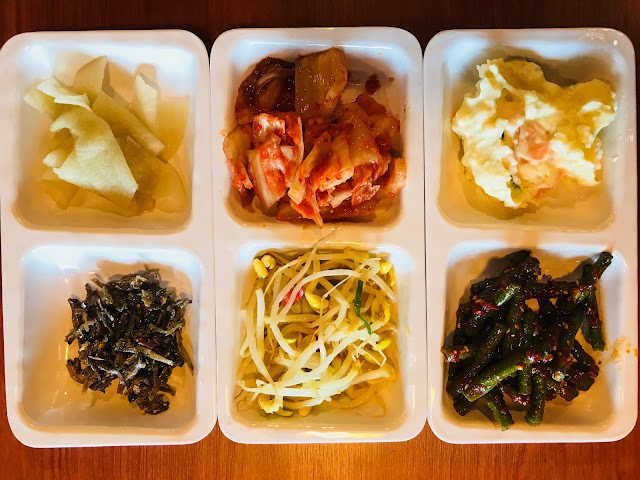 My favourites are the kongnamul-muchim (soybean sprout side dish), kkakdugi (diced radish kimchi) and kimchi. 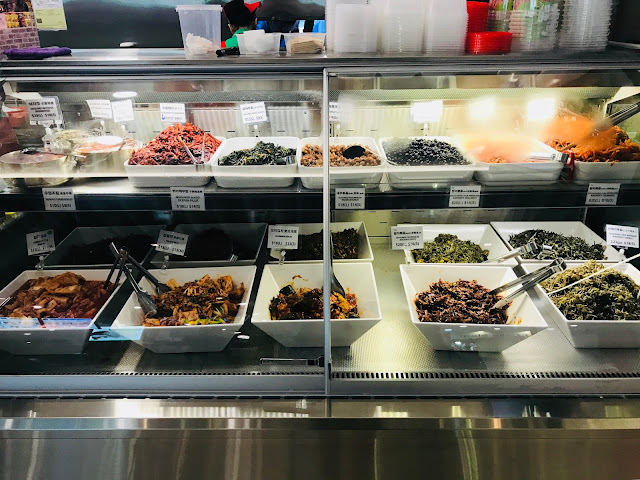 All the side dishes are made in their central kitchen in Singapore according to the recipe given by the lady boss before being brought over to the restaurant to ensure freshness. 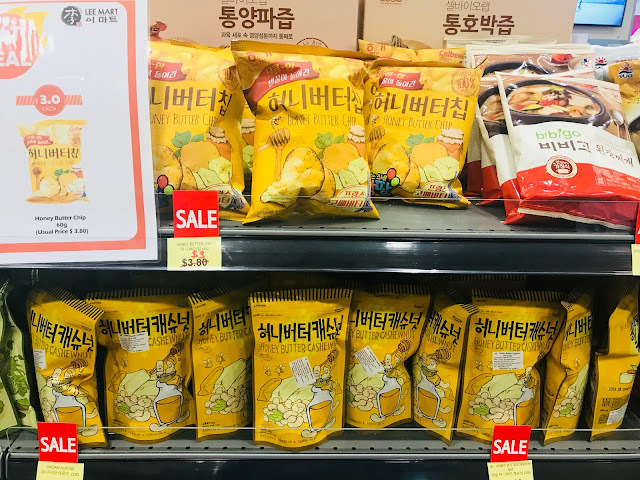 I am totally in love with their kimchi which is more sour than spicy. 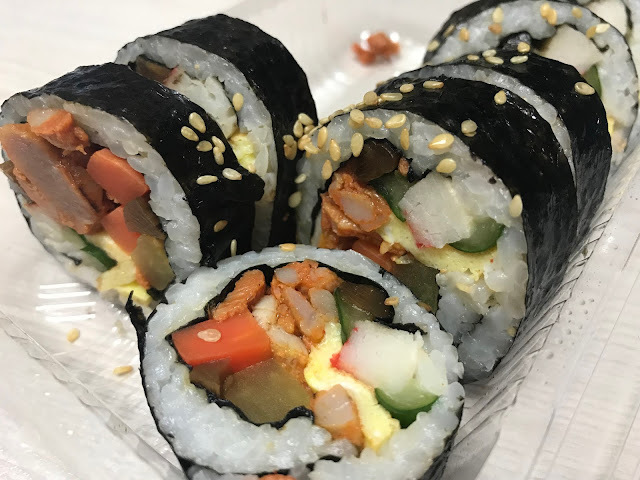 Gimbap can be ordered as both dine-in or takeaway. 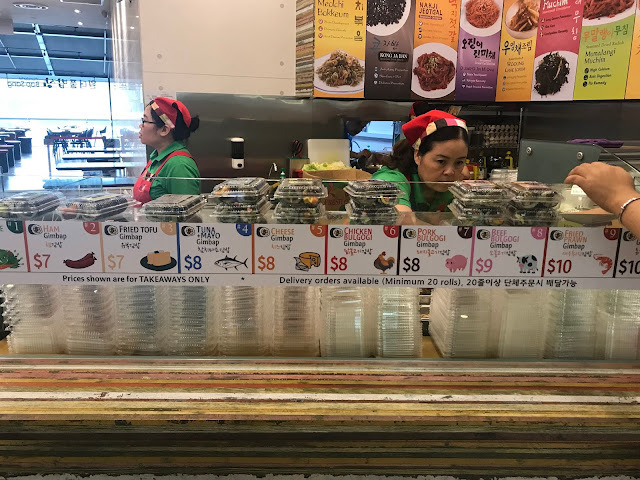 There are 10 filling to choose from: Vegetable Gimbap [$7], Ham Gimbap [$7], Fried Tofu Gimbap [$7], Tuna + Mayo Gimbap [$8], Cheese Gimbap [$8], Chicken Bulgogi Gimbap [$8], Pork Bulgogi Gimbap [$8], Beef Bulgogi Gimbap [$9], Fried Prawn Gimbap [$10] and Tonkotsu Gimbap [$10]. The gimbals are freshly-made upon order and they are great for a quick takeaway lunch or dinner. 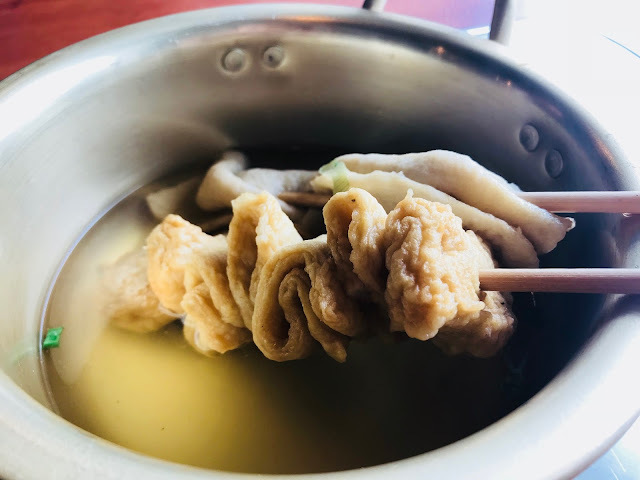 Kkochi Eomuk (Fish Cake Soup) [$6.60] is one of the most popular street food in Korea but not all Korean fish cake are made equal. 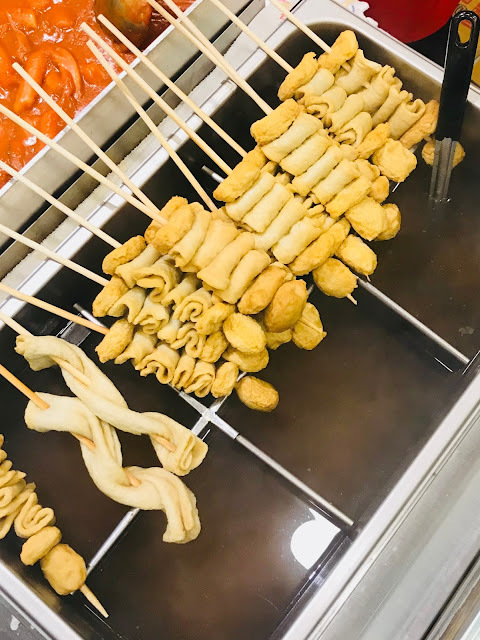 This is a far cry from the addictive fish cake skewers I had at Dookki. Both the fish cake and the soup are bland and tasteless. 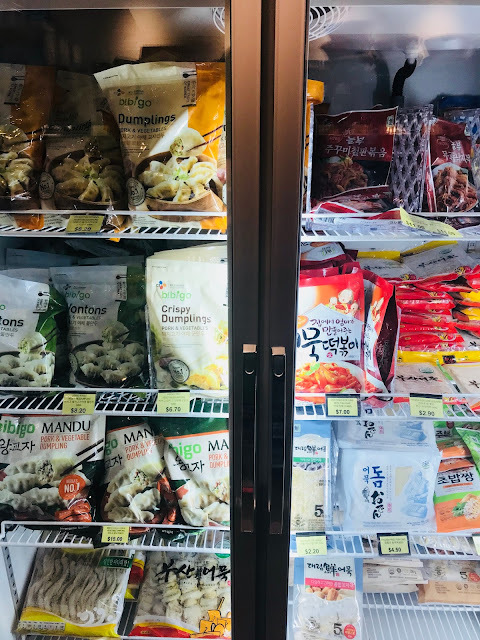 Koreans call dumplings“mandu” and Twigim Mandu (Deep Fried Dumplings) [$5.80] is the deep-fried version. 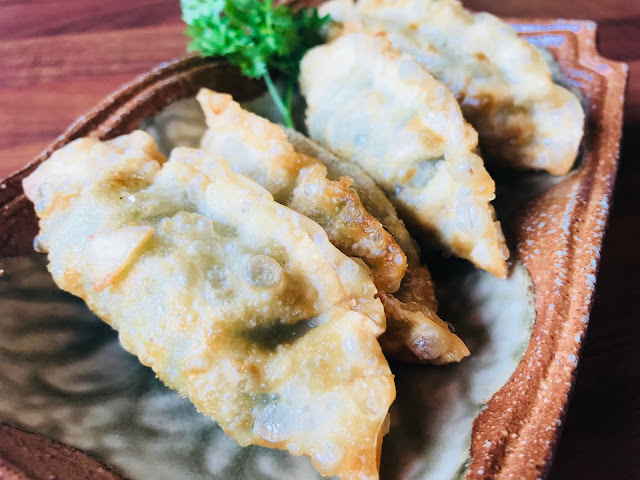 Unlike its Japanese counterpart which is normally filled with meat, these Korean dumplings are filled with vermicelli and chopped vegetables which gives it a more refreshing taste. Eat them while they are not to enjoy the crispy crackling skin. 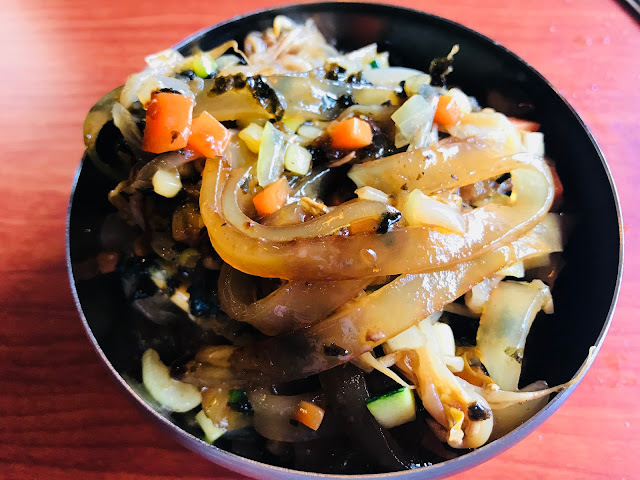 Egg Jjim [$5.80], also known as Gyeran Jjim (“gyeran” mean “egg” in Korean) is a simple yet delicious dish. 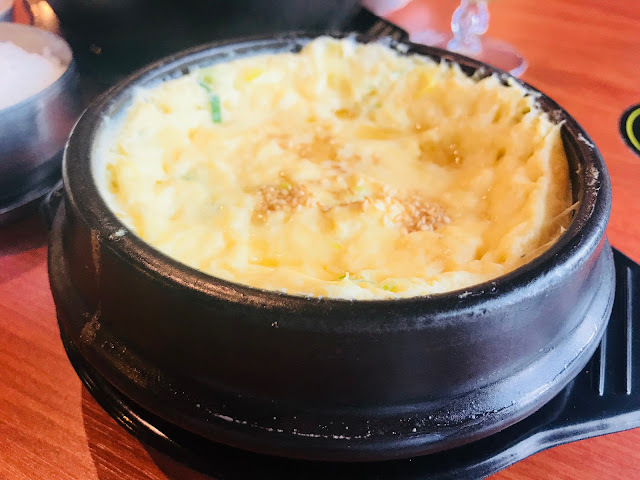 It is commonly served together with spicy Korean food as the smooth egg custard does a good job of mellowing spiciness. 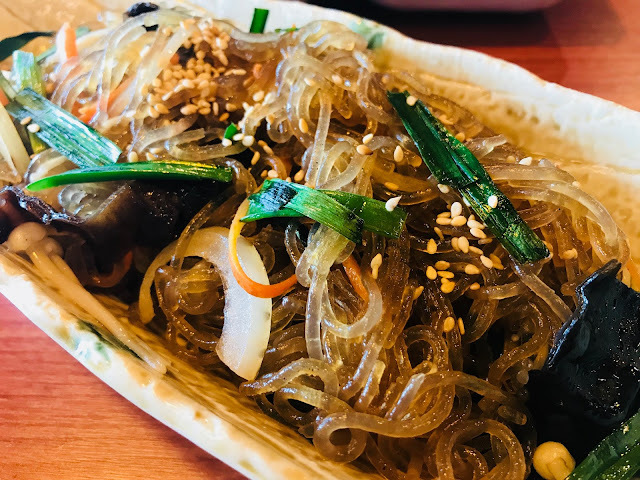 I have been to quite a few Korean restaurants yet this is the first time I am having Japchae (Glass Noodles with Vegetables [$13.80] in Singapore. 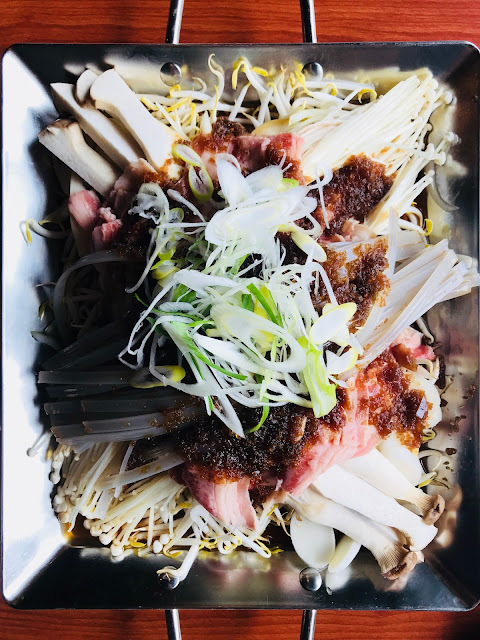 Glass noodles are stir-fried with vegetables such as onions, mushroom, black fungus, carrot strips and chives in a light soy sauce seasoning. The springy glass noodles go perfectly with the fresh vegetables. 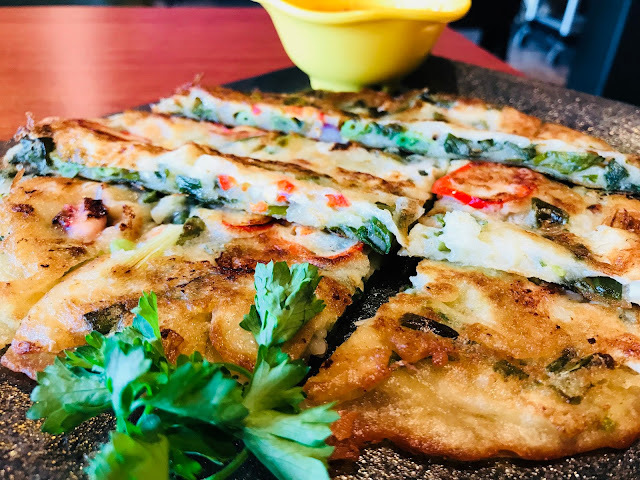 Pajeon (Seafood Pancake) [$10.80] is Korean pancake made mainly with spring onion and squid, accompanied by spring onions and chives. The sliced chilli gives the otherwise plain-tasting pancake a kick. Donggaesu (Pork Cutlet) [$14.80] is the Korean version of Japanese tonkatsu. 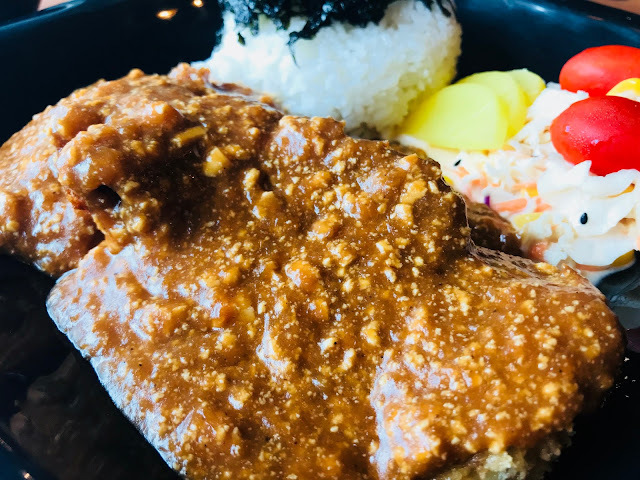 Instead of being presented as it is, the Koreans serve the crispy pork cutlet with a sweet and spicy sauce accompanied by vegetables, rice and soup. 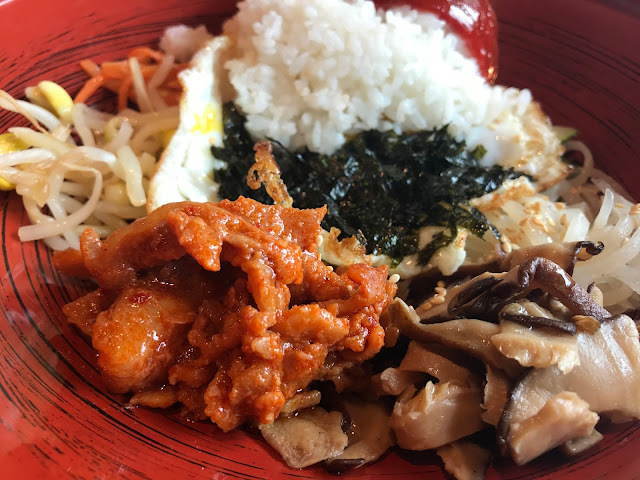 This is your classic Bibimbap [$12.80], where an assortment of vegetables such as soybean sprouts and mushrooms are mixed with a choice of beef/chicken/pork/vegetables, a fried egg and Korean red pepper paste. Mix everything up for a delicious yet healthy meal. I especially love the huge soybean sprouts which are so crunchy. 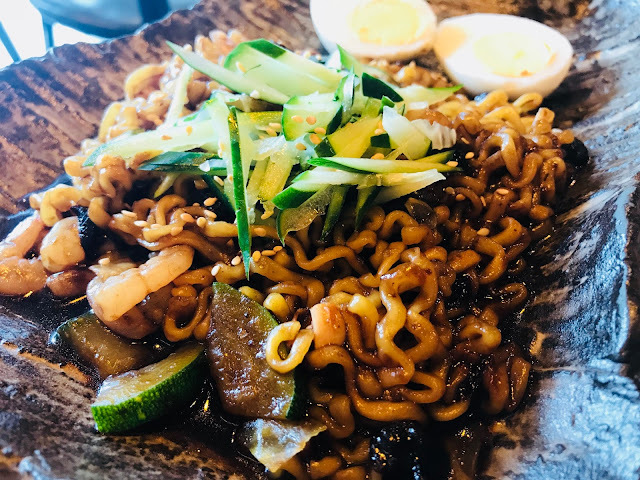 Jjajang Ramyeon (Black Bean Paste) [$11.80] looks good but it is a far cry from the slurp-worthy Jjajang Meon from Guksu Restaurant. The black bean paste just lacks that punch, you know what I mean? 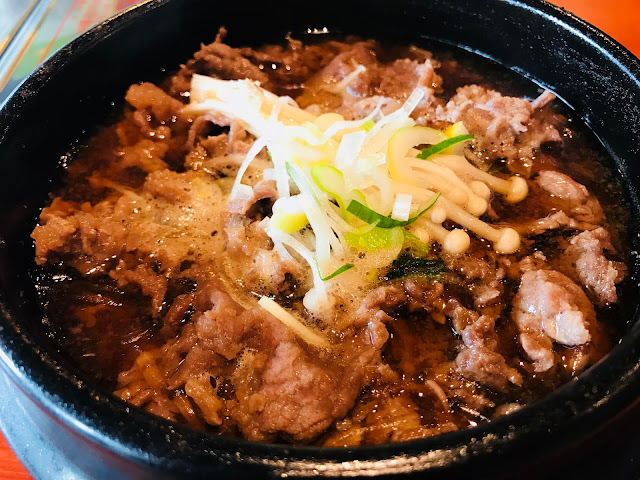 Wonderful Bulgogi [$31.60] is a huge dish that is meant to be shared by 2-3 people. You have the option of having it cooked in the kitchen or on the stove in front of you. 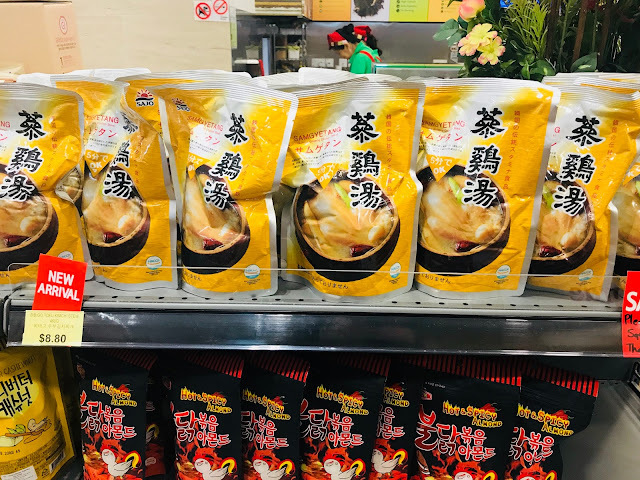 Glass noodles and vegetables are cooked with your choice of chicken/beef/pork. There is also an option to have the staff make fried rice with the leftovers at the end of the meal. 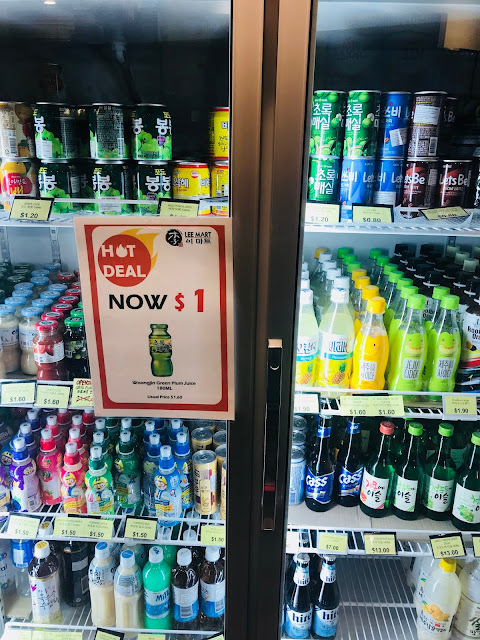 For those who are dining alone but still want to try bulgogi can opt for Ttukbaegi Bulgogi [$13.80]. 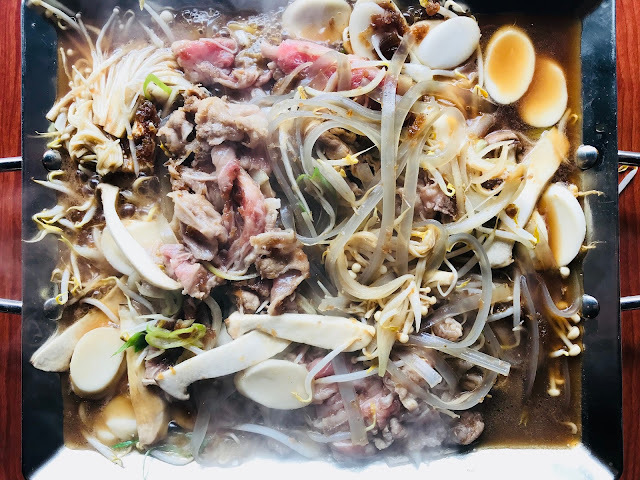 You have a choice of chicken, beef, pork or vegetables cooked together with glass noodles and mushrooms, served in a black Korean earthenware called ttukbaegi. It is currently available in the lunch menu at a special price of $11.80. 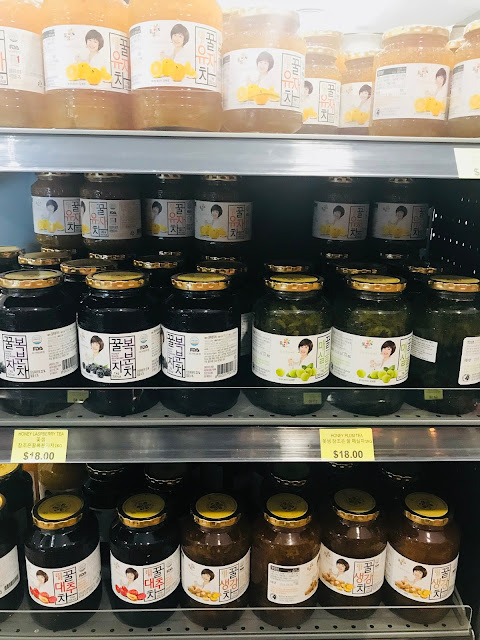 Koreans love their soups and Samgyetang (Ginseng Chicken Soup) [$19.80] is popular in many countries. 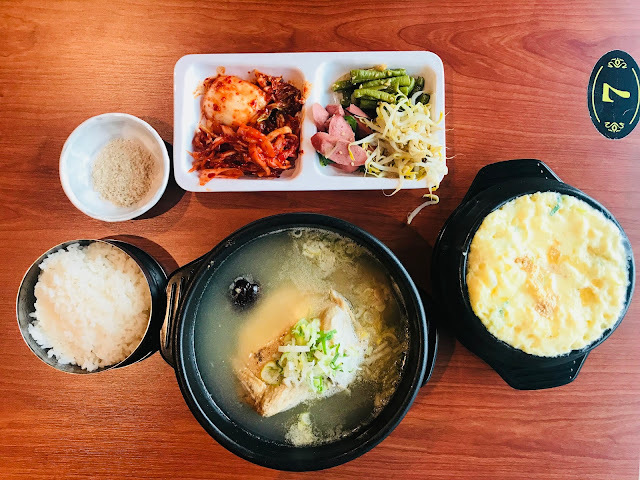 Samgyetang is traditionally eaten on the hottest days of summer as a way to keep up their energy and to balance their body heat against the hot weather. A small chicken is stuffed with glutinous rice, ginseng, garlic and jujube (red dates). The soup is so flavourful and the chicken meat literally falls off the bone. 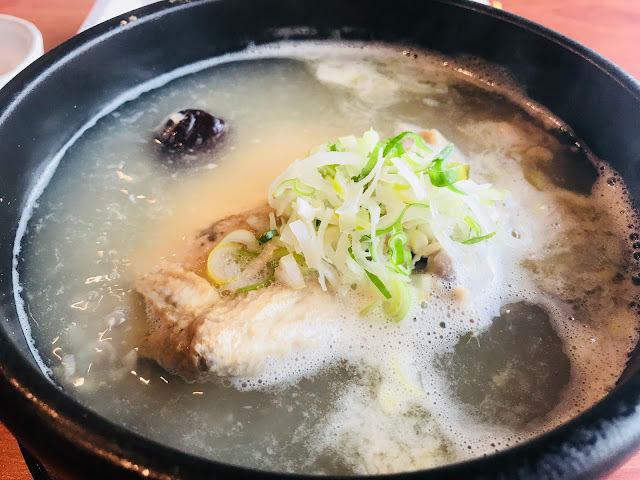 Those with smaller stomach can opt for Ban Samgyetang (Half Ginseng Chicken Soup) [$12.80] or upgrade to the luxurious version Abalone Samgyetang (Ginseng Chicken Soup with Abalone) [$22.80]. 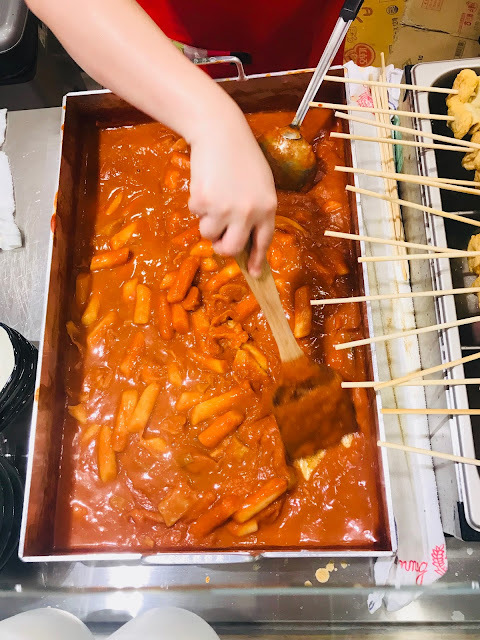 You can buy Tteokbokki (Spicy Rice Cake), Kkochi Eomuk (Fish Cake Soup), Gimbap and more than 16 different Korean side dishes at the takeaway counter. 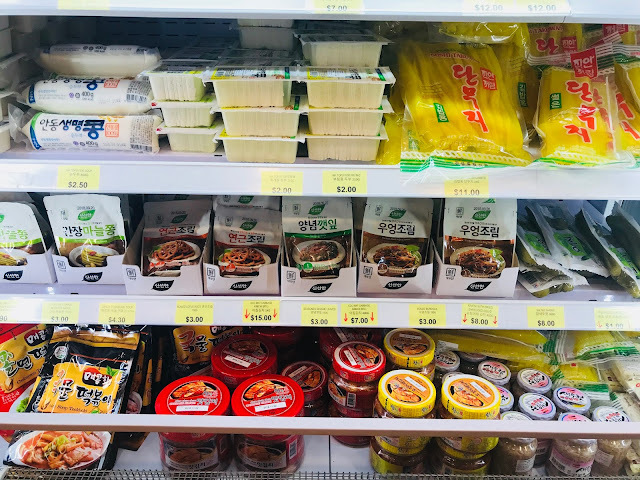 Everything in Lee Mart Kitchen is imported straight from Korea so you can be assured of quality. 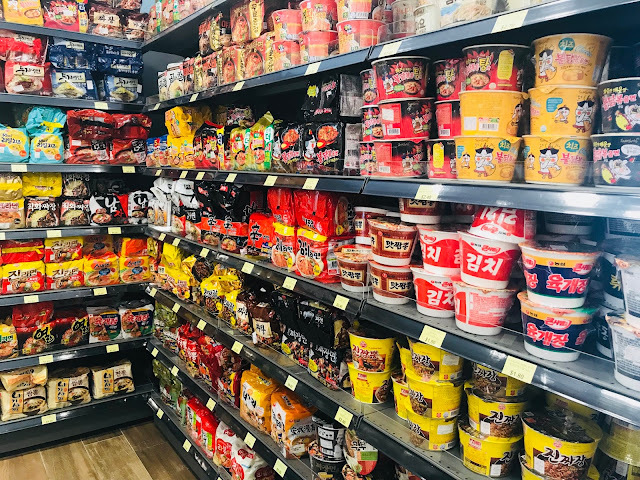 You can get pre-packed samgyetang, ramyeon, kimchi, mandu, drinks … all the Korean food you can ever want can be found here. 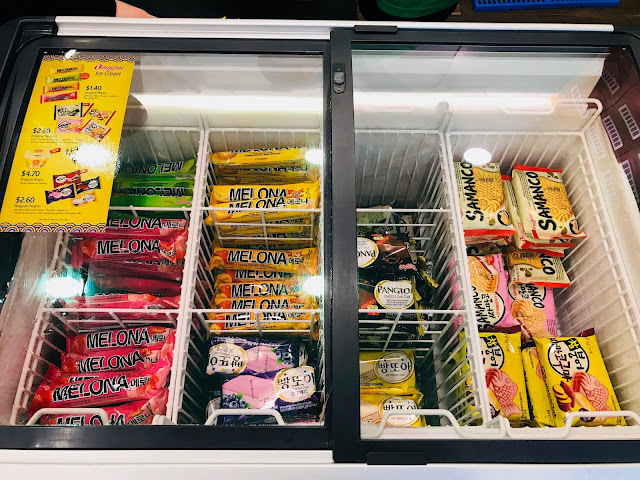 Those fruit-flavoured ice-cream popsicles are the perfect desserts.